If you've spent every spare musical minute within the confines of the iTunes window you might believe there are only five audio formats—MP3, AAC, WAV, AIFF, and Apple Lossless. It turns out, however, that when you waltz around the Internet you come upon a variety of other audio formats, not all of which play nicely with your computer, iPhone, or iPod. Windows Media files (.wma) are commonly found, but there are others. Ogg Vorbis and FLAC files, while not as common as .wma, MP3, and AAC files, are favored by many audiophiles who prefer the quality of their sound. Regrettably, none of these file types are natively supported by iTunes or QuickTime. Fortunately, getting them to play on your Mac is possible. With a little conversion magic and the proper add-ons, the audio contained within them will soon pour through your Mac’s speakers. The Windows version of iTunes is capable of converting .wma files, but the Mac version isn’t. And that’s too bad because there isn’t a way to natively play .wma files in iTunes nor are there a lot of free .wma file converters around. Of those free converters, I’ve found NCH Software’s Switch to be helpful. With it you can batch convert a load of .wma files to a host of formats, including MP3, WAV, and AIFF (Switch doesn’t export to AAC or Apple Lossless, however). Once you run your .wma files through Switch, they can be tossed into your iTunes library and copied to an iPod, iPhone, or Apple TV. If you simply want to listen to these files in QuickTime Player or another QuickTime-compatible application (other than iTunes), download the free Windows Media Components for QuickTime. With those components installed and a copy of QuickTime Player Pro, you can take advantage of this trick (courtesy of Mac OS X Hints) to save your .wma files as QuickTime reference movies, which will play in iTunes. Fortunately, you needn’t convert Ogg Vorbis and FLAC files before you can play them in iTunes (though you have to gently fiddle with the FLAC files). Download the free Xiph QuickTime Component, install it in the Components folder within the Library folder inside your user account (create that Components folder if one doesn’t exist), quit QuickTime Player Pro and iTunes if they’re running, and relaunch iTunes. You should now be able to add Ogg Vorbis files to iTunes, where they will play normally. To make FLAC files compatible with iTunes, download and install Cubic Fruit Design’s free Fluke. It installs components necessary for FLAC files to play in QuickTime-friendly applications (including iTunes). Note that even with Fluke’s components installed I couldn’t make iTunes accept FLAC files until I changed their extension from .flac to .mov. Once I did that, iTunes was happy to have them. Automator can easily batch-convert file extensions. There are utilities that will change file extensions but you can easily create an Automator action to do the job. Just create a folder on the Desktop and call it “Convert FLAC” and drop into it all your FLAC files. Launch Automator and string together these actions—Get Specified Finder Items, Get Folder Contents, and Rename Finder Items. Drag your Convert FLAC folder into the Get Specified Finder Items action to add it (remove any other items in the list). 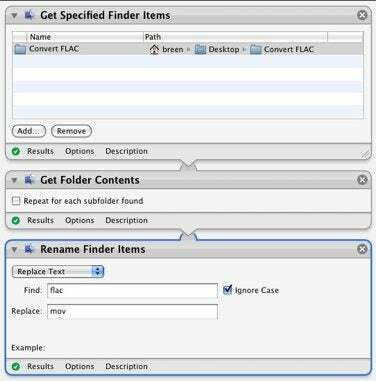 In the Rename Finder Items action choose Replace Text from the pop-up menu, enter flac in the Find field and mov in the Replace field. Run the workflow and all the files in your Convert FLAC folder will now bear the .mov extension instead of .flac. Drag these files into iTunes and they’ll be added to the library.